He also said that if restaurant owners keep their restaurant 100% smoke free he would give all administrative supports to the restaurant’s owners to get trade license easily. He also said that vigilance notice should be displayed in all the restaurants, and district administration would operate mobile court to monitor it. The meeting was presided over by Alhaz Saleh Ahmed Suleman , President of Restaurant Owners Association, Chittagong and he declared that all restaurants would be smoke free from then on and all the restaurant owners must ensure 100% smoke free environment. General sectary, president and other EC committee members were present in the meeting. The workshop was moderated by Md. 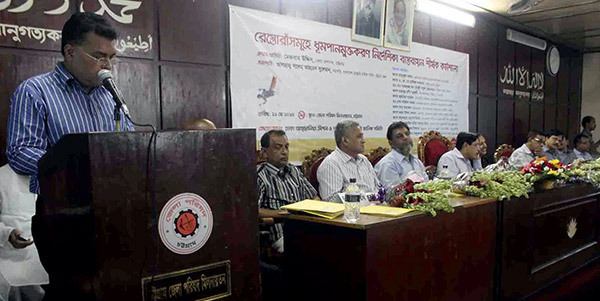 Arifur Rahman, Chief Executive, YPSA, where special guests were Mr. Mahbubul Alam President, Chamber of Commerce, A.K.M Hafiz Akhter, Police Super, Chittagong, Dr. Md.Sorforaj Khan Chowdhury, Civil surgeon, Chittagong, Harunur Rashid Hazari, Deputy Police Commissioner (North), C.M.P Chittagong, Zubayer Ahmed, Director of Vokta Odhekar Songrokkhon, Dr. Sekh Sofiul Azam, Acting President, Bangladesh Red Crescent Society, Chittagong, Abu Ahamed (Freedom Fighter), Deputy Director, Department of social welfare, Komor Uddin Ahamed Khokon, President, Central Committee of BROA, Anowar Hossain Mridha, Vice President, Central Committee of BROA, M. Rejaul Karim Sarker Robin, Secretary General, Central Committee of BROA, Md. Tawfiqul Islam Treasurer, Central Committee of BROA.